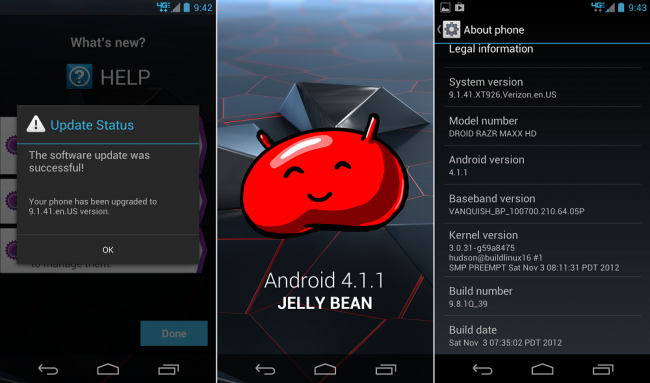 Earlier this week, we wrote that Verizon was starting to push out the Jelly Bean update to owners of the RAZR HD and MAXX HD, but it was in small batches. This morning, it seems to be a wider push and we have a lot of readers writing in to say they are getting the update. With the update, owners will be able to take advantage of Google Now, enhanced notifications, Project Butter, and an improved keyboard. Beyond that, Verizon and Motorola also improved voice and data connectivity, the user experience in the calendar, and Back Up Assistant. They removed Verizon Video and Color application, but added in the suite of Amazon apps. The update is 276MB in size.